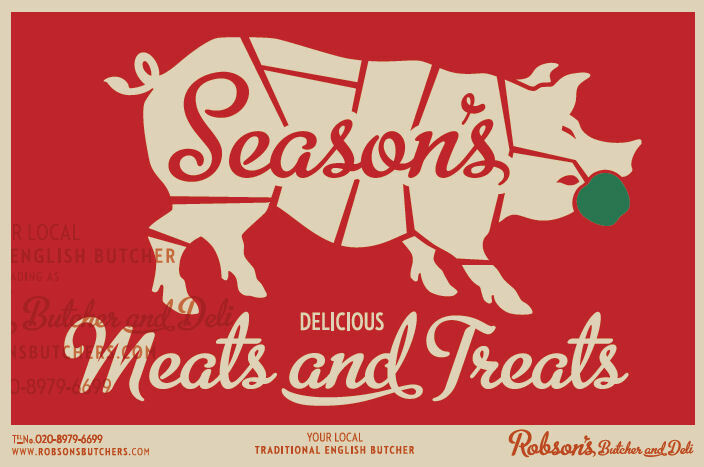 The Robson’s Christmas Tree is up, and we have some tempting treats for you to put under yours or on the table! Come along and have a look. 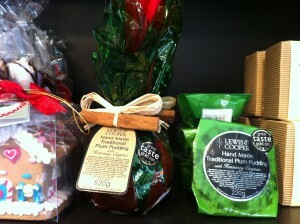 some mulled wine spices to make your own at home and have the whole house smelling of christmas. add some vodka to our French pink lemonade for a stylish party cocktail. Pavlova Meringues in a seasonal star shape – fill it with whipped cream and/or marscapone, and top with slices of pear and Clementine segments, a quick syrup made with sugar, a little water, cinnamon, star anise, clementine juice, vanilla. 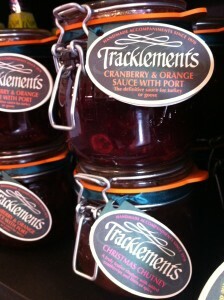 Serve with cognac or a dessert wine for festive flair! 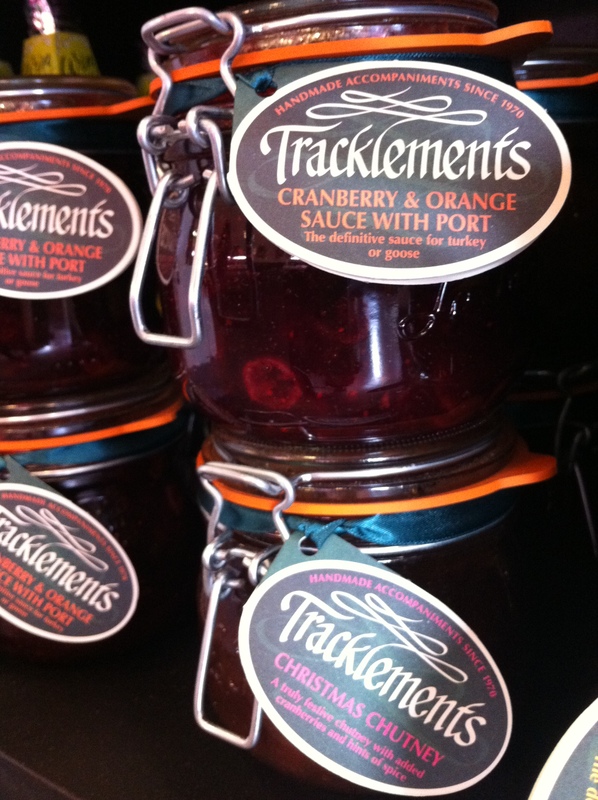 Tracklements’ Christmas chutney is full of spice and is perfect with boxing day turkey or lovely with a soft creamy cheese and crackers. Colston Basset Stilton, the one and only. All of our products can be beautifully presented and gift wrapped – Perfect to take along to a dinner party as a thank you. We can put together gift hampers for you, small or large and beautifully wrapped, or pick out a few things and we will gift wrap them for you. Preheat your oven to 170 deg C (or gas mark 3). Mix all of the glaze ingredients together and leave to one side. Place the ham in a pot, cover with water and bring to the boil. Simmer for 5 minutes then pour out the liquid and remove the ham. Remove the skin carefully without trimming too much fat. Score the fat into diamonds (about 2cm intervals). At this point you can stud each diamond with a clove for extra flavour if desired. Place the ham on a roasting tray and cover lightly with foil. Cook for about 2 hours (roughly 30 mins per 500g). Remove from the oven, pour the glaze over the ham and return to the oven for a further 30 minutes. Baste at regular intervals with the juices from the bottom of the pan. Sticky, sweet and delicious! Enjoy! Impress with a Free range Three Bird Roast which we’ll tailor to your specifications (popular combinations are turkey, goose and pheasant; and goose, chicken and pheasant). These are all layered with stuffing, and we have a choice of flavours. Turkey crowns for those who don’t like the dark leg meat, and Rolled boneless Turkey breasts for ease of cooking and carving – both made from our Free range bronze Turkeys from Temple farm. 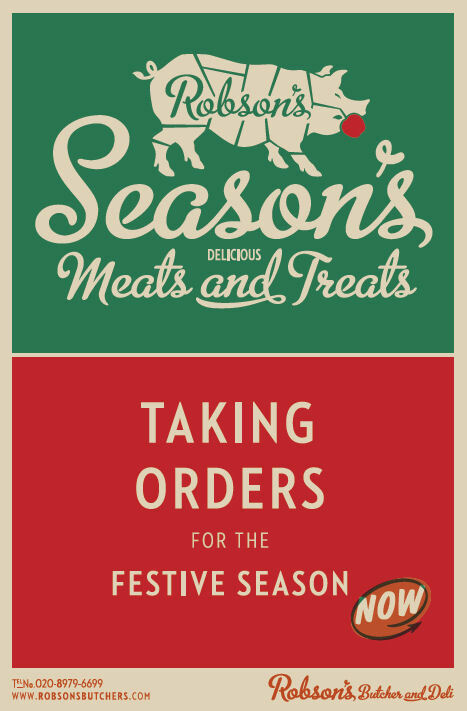 Place your Christmas order and stand a chance to win The Festive Hamper to the value of £100 AND your original order on us! 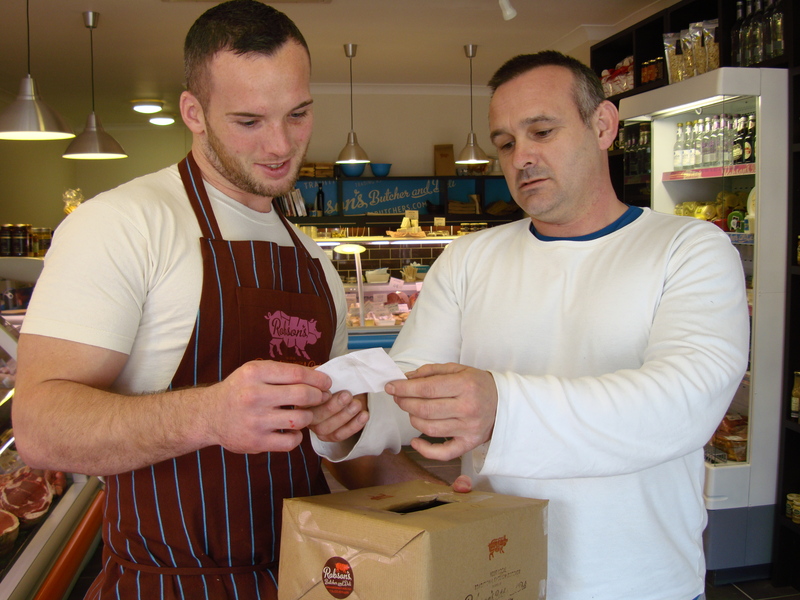 Don’t forget to order your cheese board and deli goodies at the same time, and it’s always a good idea to order your New Year meat before Christmas so that it’s all organised and you can rest assured over the holiday that the boys have it in hand. If you’re not sure what to cook for christmas, need some advice, or are working to a budget, just give us a call and we’ll come up with the best options for you, take special requests, and give you some great tips. Lily and Jack’s chickens win the prize! 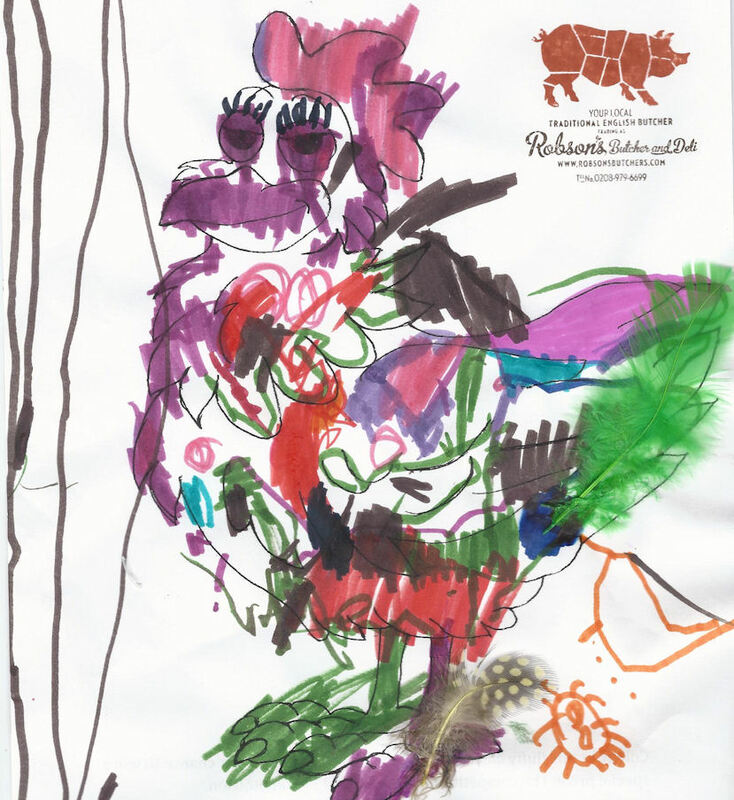 A huge thanks to all the young artists who tackled the Robsons Hampton Hill Summer Festival Colouring Competition. We had loads of really gorgeous entries, and Nan had a truly tough time picking! However, pick she did (Nan doesn’t let a difficult choice get inbetween her and her Sunday roast). Congratulations to our winners, sister and brother, Lily and Jack! 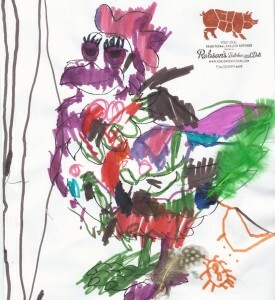 Your fabulously feathered chicken and marvelously colourful disco chicken were really fun and looked fantastic on our Robsons wall of fame – Thank you! 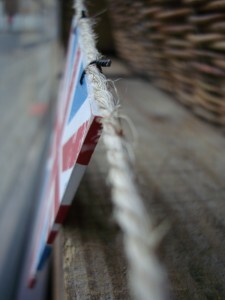 I have found some fantastic new ranges for the shop recently and will slowly be introducing them from the end of the month. 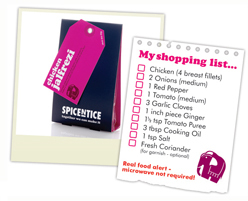 The first is a divine range of spice kits. I met Ketan and his sister last week and their business started when he was at university and his mum sent him recipes and spices to make real Indian curries that would remind him of home. I love this family run business. 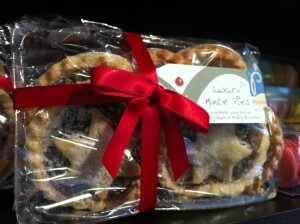 The kits are not expensive, have very clear instructions and taste fab. We had the Rogan josh (Zach’s favourite! )for dinner last night and it was delicious, simple to make and much healthier than any takeaway version! 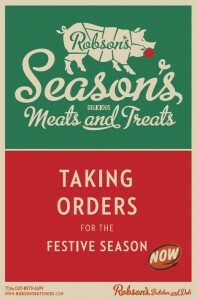 We will also be stocking their Peri Peri chicken, Moroccan lamb tagine and other world flavours, so come try them out! 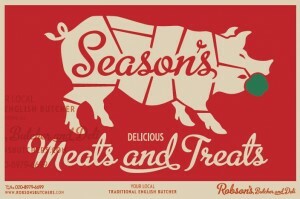 From November we will also have their range of rubs in the most gorgeous collectable tins. Not sure which ones I love more!? 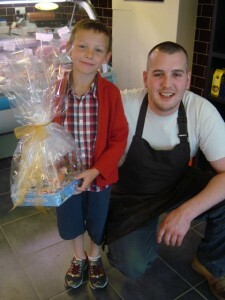 Thanks to all of you intrepid treasure hunters who braved the rain and entered our Summer Festival Piggy Treasure Hunt. Well done Nathan! (age7) His was the first correct entry drawn out of our hat. When his family get back from their summer holiday they can look forward to the Family Barbecue Hamper that he won and we hope his kite prize is keeping him busy. Happy flying, Nathan. We will be running another hunt later in the year and at Christmas, so keep a look out for those sneaky pigs! What fun to have a Royal Wedding to celebrate! Anyone making celebration cakes for the day, please feel free to drop in with a couple of slices for the Butchers! 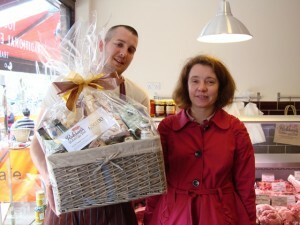 Congratulations to Julie Penn on winning the draw for our fabulous hamper! As well as a beautiful basket full of Robson’s finest goodies, Julie also received a voucher for the meat and deli counters. Thanks to everyone who took part and also to the helpful customer who drew the winning ticket! 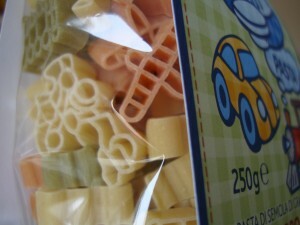 My son Joshua loves these cute travel pasta shapes. The aeroplanes are his favourite! We also have little teddy bears to tempt those fussy eaters. All natural, made with durum wheat semolina, water and dehydrated spinach or tomato for colour. 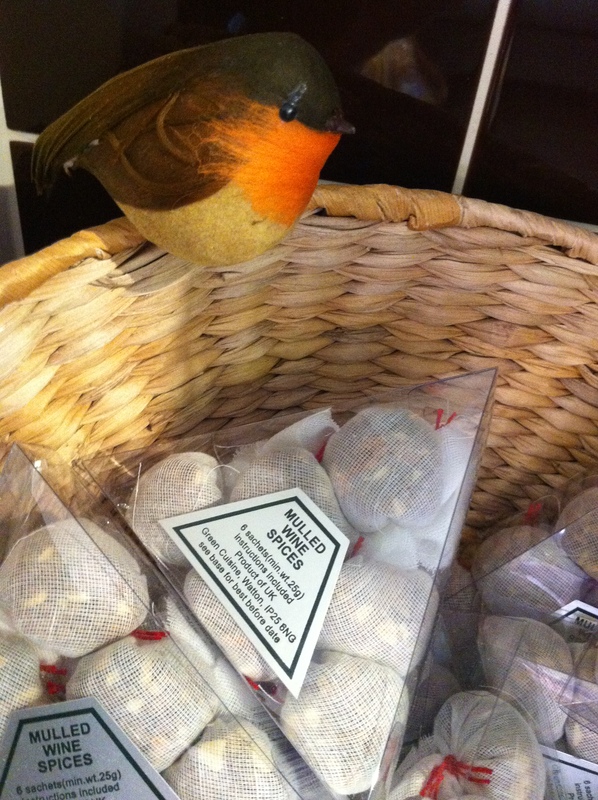 When we had two requests for Black Bomber Cheddar in the same day this week, we knew we had to get some in to taste. We’re really glad we did! 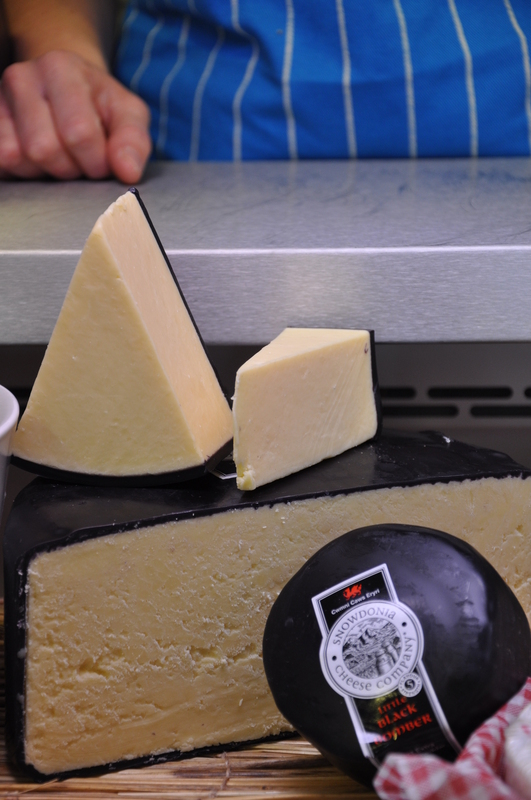 This award winning Cheddar is smooth, strong and creamy. Everyone who has tasted it in the shop so far has expressed delight at it’s deep smooth flavour. Very tasty! The Little Black Bomber Cheddar is a brilliant addition to any cheese board or just have a wedge of it with honey roast ham, fresh bread and pickles! This Welsh cheese is made from pasteurised cows milk and is suitable for vegetarians. 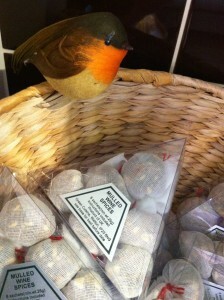 We have it in individual 200g Truckles or a wheel in the deli counter that we can cut to any size. 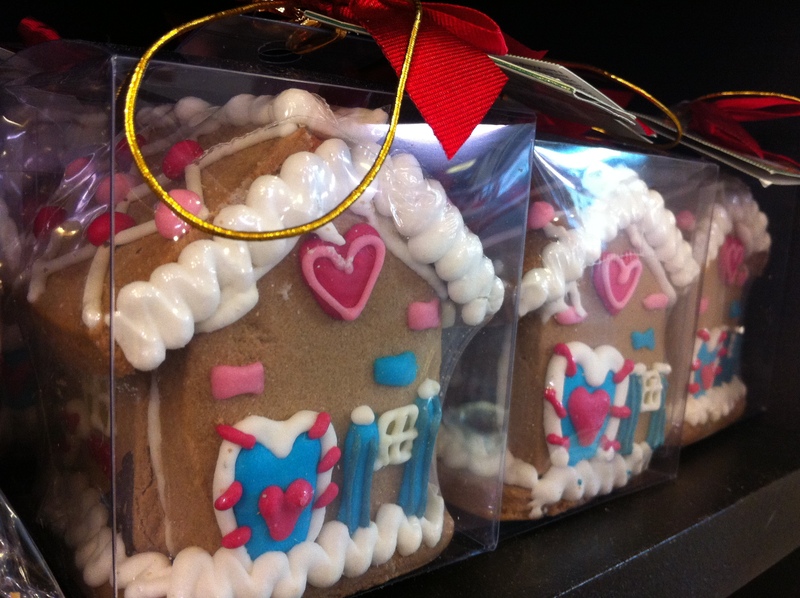 When you’re next nearby, pop in and have a taste!